Most coming-of-age stories about young teenage girls tend to revolve around the themes of popularity, overcoming self-confidence issues regarding physical appearance, and crushes on boys who tend to have only their charm and good looks to recommend them. Whisper of the Heart (耳をすませば /Mimi wo Sumaseba, 1995) refreshingly presents a young female protagonist with other things on her mind than such superficial concerns. Shizuku Tsukishima gets along well with her fellow classmates and shows a talent for writing which she demonstrates through writing new Japanese lyrics for John Denver’s 1971 hit song Take me Home, Country Roads for her junior high school graduation. Shizuku is also an avid reader. The library is in the process of switching from the old card system to a new computer system, which saddens Shizuku because she likes to read the names of the people who have taken books out before her. She begins to notice that many of the books that she reads have been previously been checked out by a boy called Seiji Amasawa. One day, while taking the train to the library, Shizuku notices a lone cat sitting next to her. Fascinated by the cat’s boldness as he disembarks the train at the same station as her, she decides to follow him. Climbing up the hills of Tama New Town, the cat leads her to an antique shop. She befriends the shop’s elderly owner Nishi-san and is fascinated by an unusual statue of a cat known as the The Baron. Shizuku eventually discovers that Nishi-san is the uncle of Seiji Amasawa – the boy who has been reading the same books as her. Shizuku had already had some chance encounters with Seiji, and thought him arrogant, but she soon learns of his passion for making violins and his plans to go to Cremona to become an apprentice violin craftsman. At this point, the story could have turned into a sappy tale about long-distance, unrequited love, but it does not. Shizuku tells her best friend Yuko that she is worried that she is not good enough for Seiji because she doesn’t know what she wants to do with her life. Seiji’s dedication to his craft inspires Shizuku to become a writer and she decides to write the story of the cat statue The Baron. Shizuku’s imaginative story is shown to us in a series of beautiful dream sequences which were so popular with audiences that Studio Ghibli eventually made a film based upon them called The Cat Returns (猫の恩返し/ Neko no Ongaeshi, 2002) which was directed by Hiroyuki Morita (森田宏幸, 1964). The rural-urban mix of landscape in Tama. 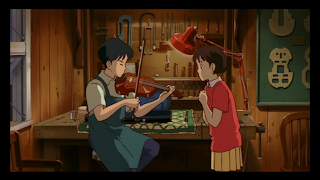 The main focus of Whisper of the Heart is not really whether or not Shizuku will get the guy in the end, rather it is about Shizuku finding out what she want to do with her life professionally. The secondary level of the film is about the location and the times. Tama New Town is a suburb of Tokyo that was developed on rural land which had once been as idyllic as the Sayama countryside in My Neighbour Totoro . In fact, the destruction of the Tama Hills habitat was at the heart of the plot in the Studio Ghibli film preceding Whisper of the Heart, Isao Takahata’s Pom Poko (平成狸合戦ぽんぽこ/ Heisei Tanuki Gassen Ponpoko, 1994). Shizuku’s new lyrics for Take Me Home, Country Roads expresses not only the personal journey that she is on, but it also a nostalgia for Japan’s fast-disappearing rural landscapes. 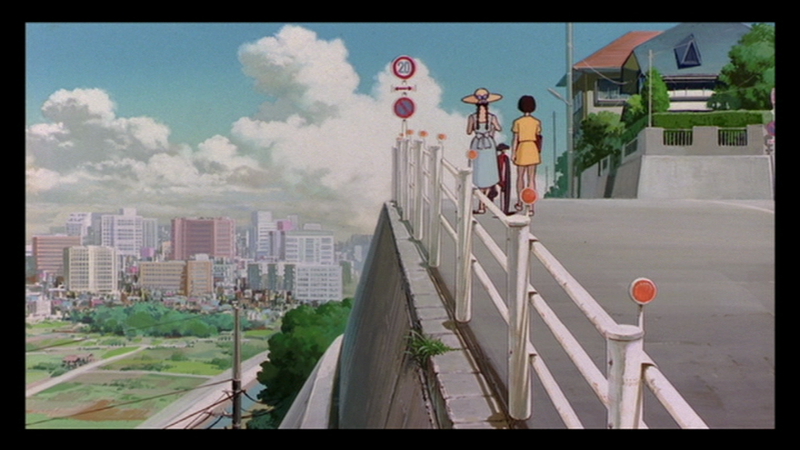 The most poignant moments in the film occur when Shizuku is up on the hill looking out at the mixed rural-urban landscape of the Tama Hills. Each frame of the film is beautifully crafted with the complexity of image and attention to detail that one has come to expect from a Studio Ghibli film. This was the first and sadly only film directed by Yoshifumi Kondō (近藤 喜文, 1950 - 1998), a long-time collaborator of Hayao Miyazaki and Isao Takahata whose untimely death brought to an end their goal of grooming him to take over directorial responsibilities at the studio. The film is jam-packed with references to earlier Ghibli works – not only in terms of characters and plots, but also visual references for the keen of eye. 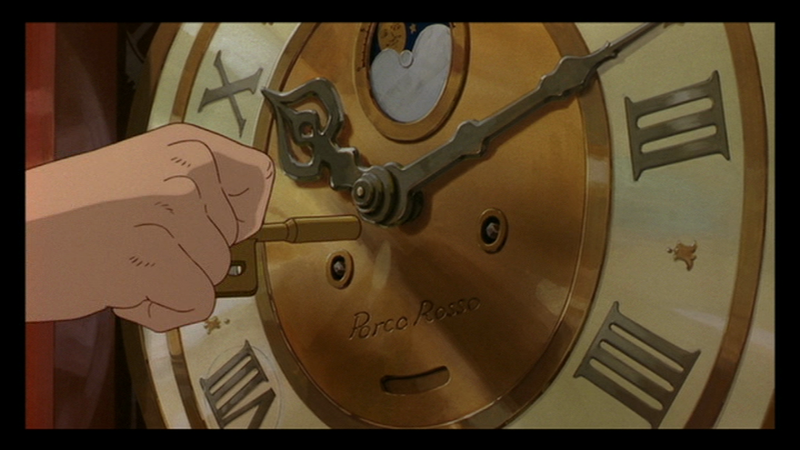 The international title of Hayao Miyazaki's 1992 film Porco Rosso (紅の豚/ Kurenai no Buta) inscribed in the grandfather clock that fascinates Shizuku in the antiques shop. 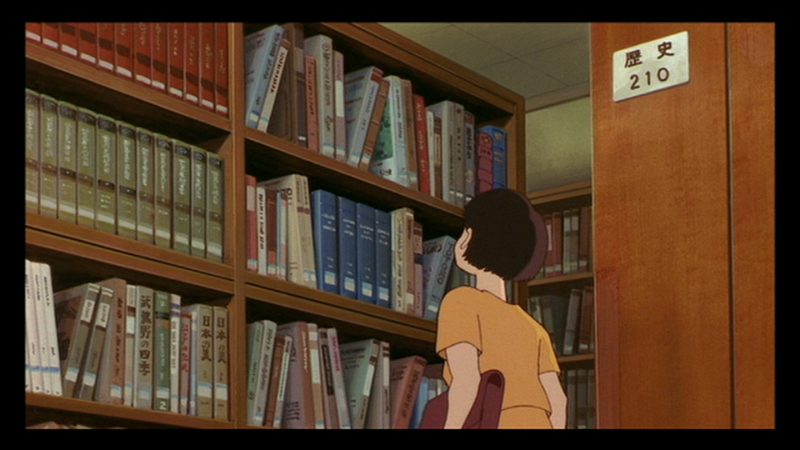 If you click on the above picture and then enlarge it, you can see that the blue book on the shelf in front of Shizuku's face is titled "Totoro". 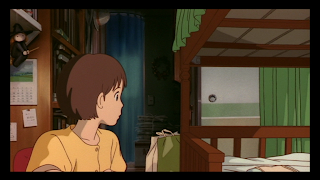 In the bedroom Shizuku shares with her older sister, there is a little witch on a broom hanging from the bookshelf - an obvious reference to Kiki's Delivery Service (魔女の宅急便, Majo no Takkyūbin). I would not be surprised if there were even more. Whisper of the Heart is a delightful film for young and old alike.